As I mused about my first post for this brand-spanking New Year, I thought of my 6th grade teacher, Mrs. Smeltzer. Mrs. Smeltzer was old school in every way, and as tough as nails when it came to helping us live up to our potential. She walked to school every day, regardless of the weather- and in Michigan, that’s quite a badge of honor. We learned handwriting with fountain pens. If you blobbed ink on your middle finger, she knew you weren’t holding your pen correctly. She rewarded success, pointed out failure and gave each student a way to do better and achieve more. She read aloud each day after lunch, and introduced me to Laura Ingalls Wilder, Sterling North, James Whitcomb Riley and many other amazing authors that I still read today. She loved poetry, politeness, accuracy and creativity and I loved her for it. “It’s water under the bridge!” was Mrs. Smeltzer’s favorite saying. 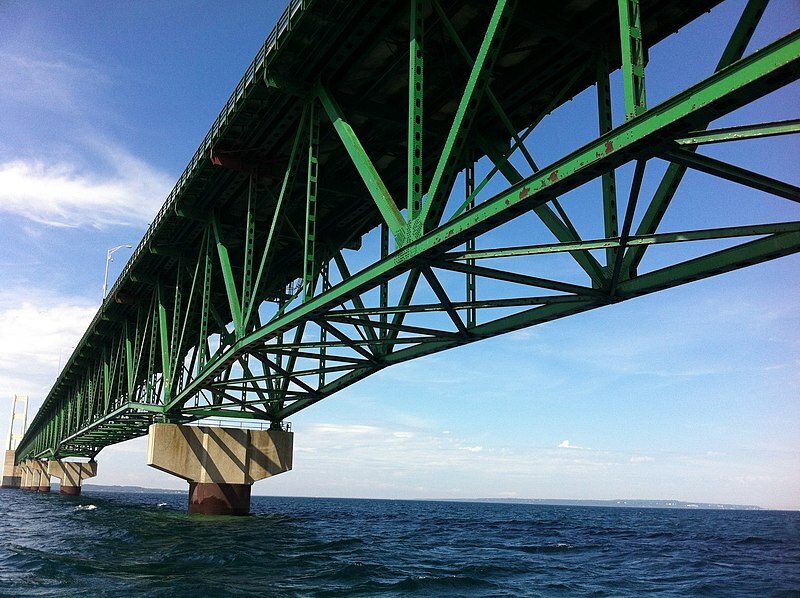 Mackinac Bridge. Image courtesy of Gregory Varnum/Wikipedia. Maybe your “water under the bridge” is wondering whether or not you’ll ever make it in this business! But what does “make it” look like anyway? Who else can judge your success but you? Are you writing every day? Are you a better writer than you were last year? Are you meeting with your critique group or partner and making hard changes based on the comments you read? Have you set reasonable and reachable goals for yourself? Are you creating something of value that brings beauty to this world? Then you are a writer my friend, and a successful one! Happy New Year, and as always, happy writing! Sensibility- You are a writer! Say that five times out loud before writing today. Sense- After saying the above, get back to work. It’s the only way to move forward in writing and in life. What needs to be your “water under the bridge” this year? Previous Christmas Eve Reads and Happy Holidays from Sensibility and Sense! Next I’m A Writer. I Should Know Better. I know my friend! I know! But we can do this! Wise words. I’m sending that self-doubt away, away, away. Thanks for the reminder. I am a writer, I am a writer, I am a writer…now I’m going to write!